I prefer the Zero-Elevation Wedge Anti-Thrust shape. 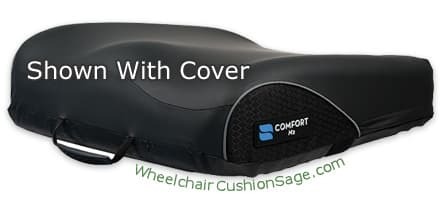 The Comfort Company's M2 and M2 ATI Gel wheelchair cushions can generally be categorized as hybrid cushions due to the weight bearing combination of foam and gel components. The manufacturer of this product - The Comfort Company - specifies this cushion as follows. The M2 and M2 ATI gel cushions consist of a multi-layered contoured foam structure in which is sandwiched a Quadra3D gel component. The gel component is glued inside a sandwich of foam and is not intended to be user-servicable. One result of this gel sandwich structure is that the cushion's top surface feels more firm (i.e., less soft) than some gel cushions. The M2s' foam base shape can be specified as either: Zero-Elevation, Wedge, or Anti-Thrust. The shape on which it is easiest to move is the Zero-Elevation. The Wedge shape slopes up toward the front - it's taller in the front - for the purpose of helping to reduce forward leaning. The Anti-Thrust shape exhibits anterior pelvic build-up to help keep hips from sliding forward. The three shape variants do not vary in cost. The M2s' cover options include Comfort-Tek and Stretch-Air materials, the Glidewear option being available for both materials. The Stretch-Air cover is the more breathable of the two covers. 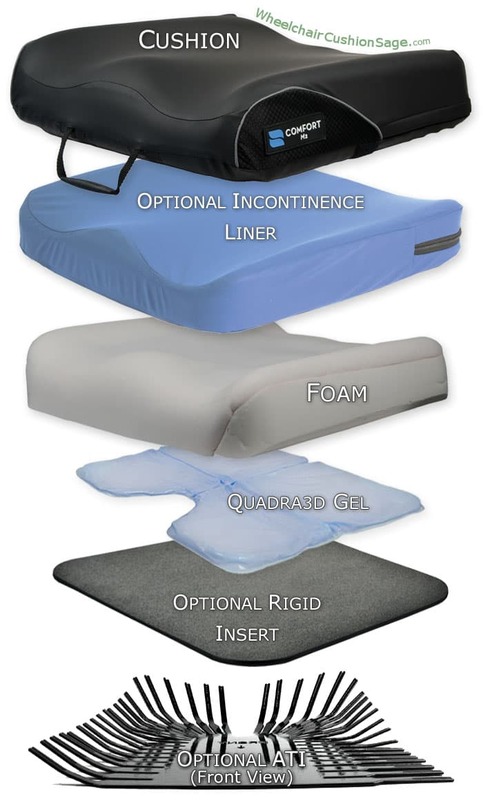 The Comfort-Tek cover is designed with an incontinence barrier - it contains a fluid resistant layer. The Glidewear option can be applied to the top surface of both the Comfort-Tek and Stretch-Air covers. Glidewear adds both a low-friction area on the rear of the cushion cover (a common shear area), and a high-friction surface at the thigh areas and gluteal perimeter that helps keep the user from slipping into a sacral seated position (i.e, a slumped position with hips too far forward). Other M2 options include: a rigid plastic insert, an accent color for the outer cover, and a metal "Adjustable Technology Insert" - ATI. The optional rigid plastic insert is a 3/16 inch thick ABS plastic board that can be useful when a more rigid cushion base is desired. The optional piping color offers a fun accent to the M2's outer cover. The standard piping color is a whitish reflective color. The optional Adjustable Technology Insert (ATI) makes the cushion model an M2 ATI. The metal ATI is the only difference between an M2 cushion and an M2 ATI cushion. The metal ATI; inserted inside the cover below the foam structure, exhibits bendable fingers that can be useful for tweaking the cushion's support. 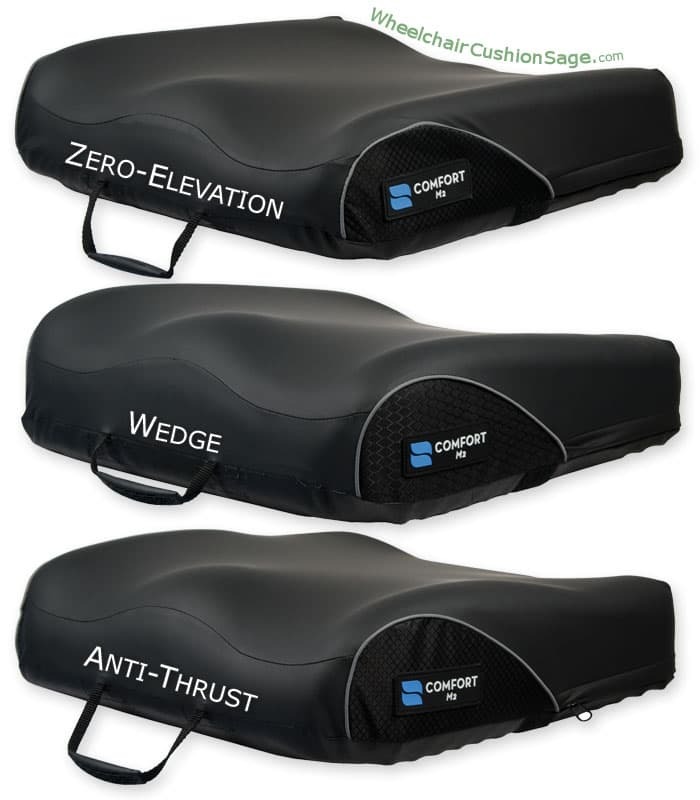 The "Saddle" cushion - a cushion also made by the Comfort Company - is; aside from the cover, identical to the M2 cushion. The M2's handle is sewn onto the front edge of the cover. The Saddle's handle is sewn onto the rear edge of the cover. The Saddle cushion is also available here. NOTE: M2 cushions are made-to-order. The manufacturing process typically takes 4 business days. For example, if the "Fast" shipping method is selected for an M2, the actual transit time will indeed be fast (1-2 business days), but your cushion may be delayed by 4 business days before leaving the manufacturing facility. Please consider these manufacturing times when selecting the shipping speed for Comfort Company cushions.